Ignore the book cover with the sultry lady and the cleavage. That image has nothing, repeat nothing, to do with this book. Whether that’s a good thing or a bad thing depends on the reader, I suppose. For me, it’s a good thing. Based on the cover and the melodramatic blurbage (“Would She Learn the Dead Man’s SECRET?”), I was expecting a hard-boiled detective drama, filled with cliff hangers, femme fatales, and secrets revealed—pure escapism, in other words. What I got was a meditation on the nature of stories and of truth. 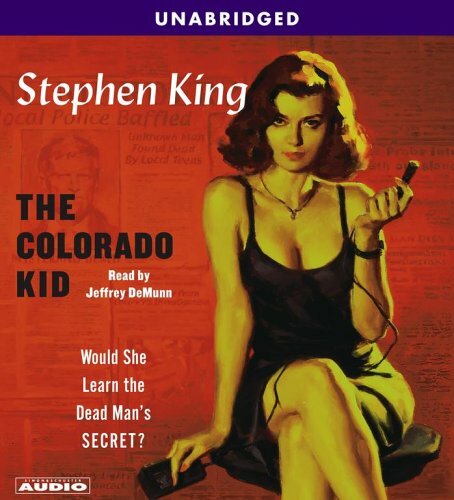 The Colorado Kid by Stephen King does indeed involve a young women hoping to learn a dead man’s secret, but the young woman, Stephanie McCann, is an intern at a small weekly newspaper—pretty perhaps, but no femme fatale with cleavage and a provocatively held microphone. The dead man actually turned up on the coast of a Maine island 25 years ago. There’s no danger here—just a story told by two old journalists, Vince Teague and David Bowie, who’ve been teaching the novice newshound the ropes. The story they tell is a straight-up mystery with more questions than answers. There are no thrills, no imminent danger, no terror, and no resolution. Parts of the mystery get solved, but the story doesn’t feel complete, and that’s the point. For Teague and Bowie, the story of the Colorado Kid is really about how we long for beginnings, middles, and ends to our stories, even though life never works that way. I write to find out what I think, and what I found out writing The Colorado Kid was that maybe—I just say maybe—it’s the beauty of the mystery that allows us to live sane as we pilot our fragile bodies through the demolition-derby world. We always want to reach for the lights on the sky, and we always want to know where the Colorado Kid (the world is full of Colorado Kids) came from. Wanting might be better than knowing. At the end of the story, we still don’t know where the Colorado Kid comes from—not entirely anyway. And so the mystery remains a mystery, just as they so often do in life. There’s something satisfying about that. As soon as I posted this review, I realized that it would work with the RIP III challenge. That’s three down, one to go in order to complete Peril the First. This was the first Hard Case Crime book I picked up—and the first Steven King—and I was expecting exactly what you were (quality pulp junk food). This book turned out to be an amazing surprised. 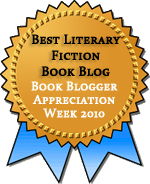 I’ve gone on to read lots more in the series and they are definitely more on the hard-boiled side of things, but I like that too when the time is right. But I was totally taken with these two old men in Maine telling this wonderful story—with no solution!—to Stephanie. Actually, I thought the cover was relevant, both for its charming reference to its pulp-noir roots (sounds like a bad hair problem you’d better take to the salon…) and for its contrast to the contents. It’s more like the mystery we want to see and expect to see, isn’t it? And usually we do, in fiction. Must be nice to be in King’s position and not have to provide it. Nice choice for R.I.P., especially given that it is from the horror master, Stephen King. I have to admit that I am a fan of the Hard Case Crimes covers, those ‘good girl’ racy covers–a throwback to the pulp noir books that came before–are a lot of fun, especially when they have little or nothing to do with the story itself. I have this on the shelf downstairs to read along with a couple other Hard Case Crime books. I read Kill Now, Pay Later from the publisher earlier this year and really enjoyed it! Carl–This is the only Hard Case book I’ve read (although I’ve read a fair bit of King’s other stuff). I’m actually not sure I’ve even seen any of the others. I’m wanting to read some of the original pulp authors (Raymond Chandler is on my shelf now), and if I like those I might look for more in this series.